Deputy Chancellor Elizabeth Rose and School Construction Authority President Lorraine Grillo testified on behalf of the city. Rose refused to admit that school overcrowding was a problem or disadvantaged students in any way, and claimed that "some of our more successful schools are overcrowded." Education Chair Mark Treyger, who pointed out that overcrowding leads to huge class sizes, loss of art and music rooms, and other evidence of a substandard education. Using closets for intervention services and increasing class size does have an impact on opportunities for kids, he pointed out. Moreover, educators aren’t robots and need working space too. But Rose refused to budge. Lorraine Grillo admitted that the SCA has only four real estate brokers on retainer in the entire city to help them find sites for schools, and yet claimed "we’ve had enormous success with our brokers" and didn't need any more help locating sites. 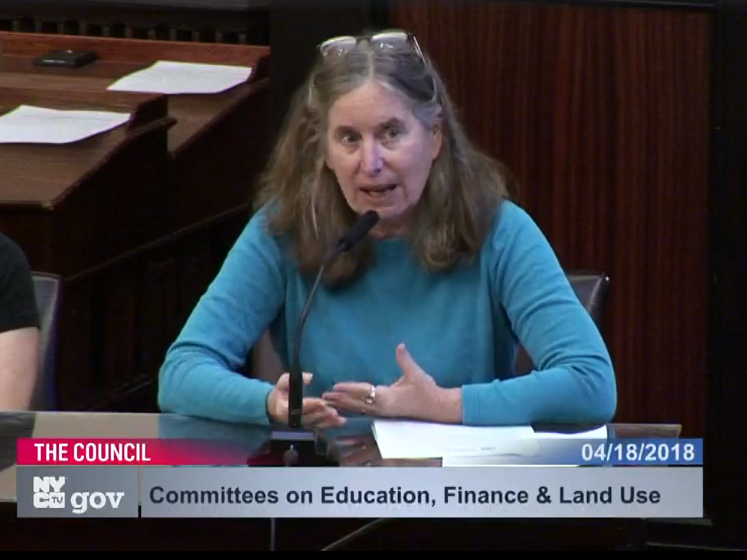 Yet Council Members Vanessa Gibson and Danny Dromm pointed out how it was they who had recently identified sites for new schools in the Bronx and in Queens and had forwarded them on to the SCA. In fact, when asked, Grillo couldn't name one school site that had been located by their brokers. As to the SCA's enrollment projections, Grillo repeatedly claimed that they were accurate within 1-2 percent citywide. However, that claim cannot be verified since neither the DOE nor the SCA release these projections publicly, and even if true, it could still mean that from district to district, neighborhood to neighborhood the projections were completely off. Finally, given how many schools are at or near 100% capacity, the difference of only a few students could bring many of them above the tipping point. 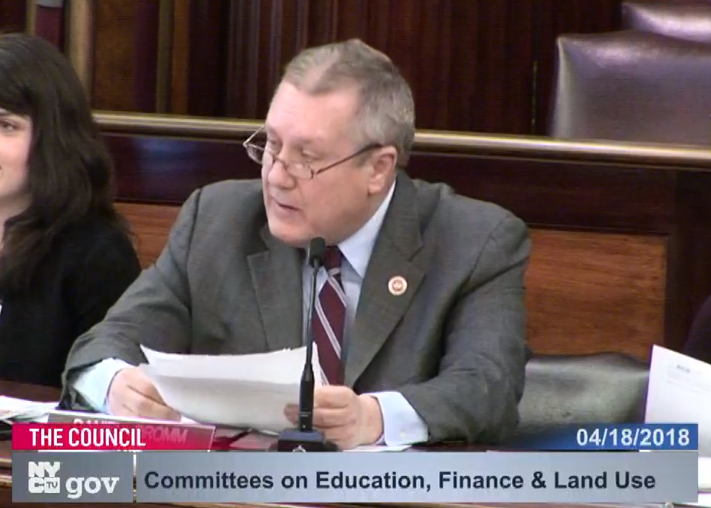 Dromm also pointed out that the majority of seats funded in current five year capital plan won’t be ready till after 2022- wouldn't it be better to do rolling ten year plan instead? By 2022, it is likely that school construction will have fallen even further behind the need. Grillo said that "we're mandated only to do a five year plan", implying that they couldn't go beyond that. Dromm: There's a huge development planned for Willis Point with 5000 housing units; but only one elementary school planned for the area. Why not include a middle and a high school in the project? Grillo responded: Queens high schools are already overcrowded (This of course doesn't explain why they won't site on there.) What about a middle school, asked Dromm? Grillo said she didn't know. The reality is that the school planning process uses a formula that is based on census figures twenty year old, and doesn't take into account either the increased numbers of preK students or charter school students in DOE buildings. 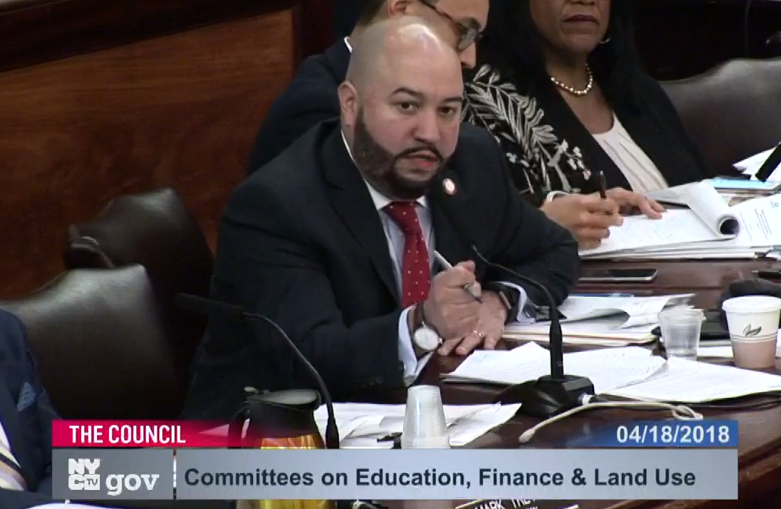 CM Rafael Salamanca, head of the Land Use Committee, also asked a series of good questions: Why does the SCA use housing data in its seat needs analyses that includes so few units built between 2019-2024, despite the current construction boom? Grillo didn't know what he meant. Salamanca then asked, Why is there only one multiplier used per borough to project the need for schools, given how the birth rate and immigration differs widely from one neighborhood to the next? Grillo responded, this is only one piece of puzzle. Salamanca also questioned why there was no effort made by the City Planning to address these issues: City Planning comes to us and says, we want 4000 new units in my district, but they have NEVER mentioned the need to build any new schools for the new families living there. Why? In many districts school overcrowding has existed for decades; and as we expand preK and 3K, and available land gets scarce and the population grows, the challenges increase to provide enough schools. We must revise our methodologies to ensure all students have the maximum chance of success. But perhaps the biggest revelation came when Council Member Treyger asked representatives from City Planning and DCAS (Department of Citywide Administrative Services) to join the DOE and the SCA at the witness table. He then questioned them if they regularly communicate with the DOE about the need for new schools. While they didn't answer the question directly, it soon became clear that there was no ongoing collaboration between these city agencies on the issue of school overcrowding, and that they are only involved when it came to major rezonings (City Planning) or when identifying available city-owned or other buildings for expanded preK and 3K (DCAS). After the questioning of government officials was over, I testified, followed by disability advocates who spoke on the need to retrofit schools for better access. Then CM Treyger asked if we felt that there was any real coordination between city agencies on tackling school overcrowding. only to the Mayor's top priorities, which up to now have been expanding preK, implementing 3K and building more housing, all of which actually contribute to worse school overcrowding rather than counteract it. Meanwhile, the only schools that are built are those where there is a tremendous grassroots effort undertaken from parents and their elected officials to demand this. An example of what it requires occurred in the hugely overcrowded community of Sunset Park last year. There have been five additional schools for Sunset Park funded in the capital plan for over 20 years without a single one built or even sited, with the DOE claiming there was simply no room in the neighborhood for new schools. Then last year, four sites were acquired by the SCA for schools but only as a result of a tremendous organizing effort of parents, community organizations, and CM Menchaca, who identified these sites and pressed for their acquisition. Not every community can do this, of course, and with the capital plan for school construction only half funded, many children will be left out. 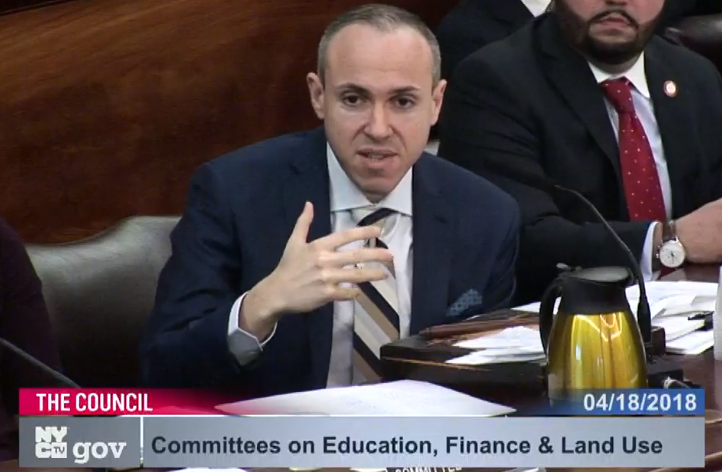 Without the active involvement of the Mayor to prioritize this issue, and without a substantial boost in spending in the capital plan, along with systemic reforms to the process of school planning and siting, the problem of school overcrowding will likely grow even more severe, and NYC children will suffer the consequences. A bill to to ensure that the CEQR formula used by City Planning is based upon the latest census data – and that it includes enrollment projections for UPK and 3K students as well as charter schools already co-located in DOE buildings. A bill to reform the ULURP process, so that proposed residential projects in areas where the schools are already overcrowded or likely to become so would require the building or leasing of new schools to provide sufficient seats to keep the schools below 100% utilization. Right now the thresholds are far too high, even in areas where the schools are already overcrowded. Any large-scale development project or rezoning should also be referred to the district Community Education Council for their comments. Often CECs are more aware of specific issues related to school capacity and overcrowding than local Community Boards. Like Community Boards, the CECs should hold public hearings and vote on whether to recommend approval, modification or rejection to the proposed project, based upon its likely impact on schools. DOE should be also obligated to report each year on how many schools seats have been added and lost, whether through lapsed leases, elimination of TCUs, annexes or for other reasons. Right now, they only report on the number of seats added rather than lost each year, which gives a highly inaccurate picture of the progress made towards alleviating school overcrowding.